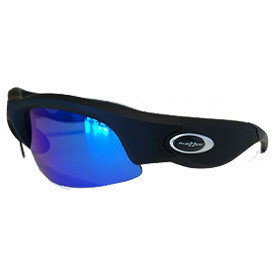 PhaZZer® DVR 5.0 Sport (Black) » Protective Solutions, Inc.
PhaZZer DVR 5.0 HD Sport Wireless Recording Eyewear utilizes a hands free audio/video recording system similar to a handheld camcorder device. The built-in 5MP camera with CMOS lens and DVR system operates with a single switch, no fumbling or slow initialization periods that may cause delayed footage capture commonly found in similar digital camera devices. This superior camcorder system is wireless, rechargeable and will directly record what the operator is viewing from eye level. The audio is captured at a limited range, but is excellent for narration and capturing audio up to a 15 foot radius. Sport style has a 110 degree wide angle and the Sport Cyclops style has a 140 degree wide angle. Operates with a single micro switch control right at your fingertips. The high definition video is stored internally on a Class 4 SDK Brand 8GB micro SD cardwith approximately 100 minutesmaximum storage capacity. Theinternally weatherproof sealedSD Card can withstand extreme hot and cold weather conditions as well as moisture and ensures the integrity of the video footage. Easy playback on your PCvia USB cord with no additional software or downloads. Also has TV output capability. High quality 1.8 mm polarized lenses exceed optical requirements of ANSI Z80.3 standards. 100% protection against all UVA, UVC and harmful blue light up to 400nm. Lightweight, shatter-proof and impact-resistant tough material - fully certified foreye protection. Available in Matte Black frames (with polarized dark tint & blue mirrored lenses) or Camouflage frames (with polarized dark tint &yellow lenses).